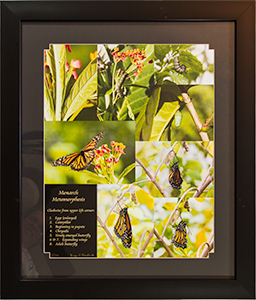 In our back yard, Nancy captured images throughout the life cycle of the Monarch Butterflies (Danaus plexippus). It starts with an egg on milkweed. That lasts about four days. 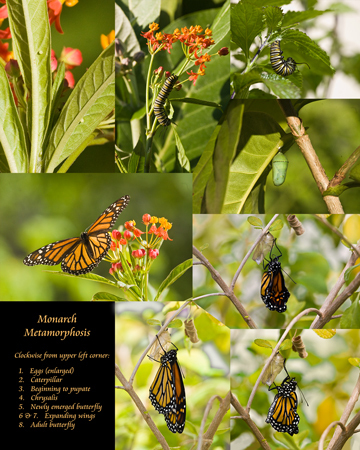 The five instars (or molts) of the larval stage last for about fourteen days to when the caterpillar moves off the milkweed and attaches itself to some fairly rigid, inconspicuous object (they can travel ten to twenty feet from the milkweed to do this). After pupating, the pupa spends ten to fourteen days inside the chrysalis (closer to fourteen here in Florida because of our climate). Every day the chrysalis becomes a little darker, starting as a nice lime green with gold trim, as in the fourth image, and becoming steadily darker until it becomes completely black. The next morning the butterfly emerges. The adult will last usually two to six weeks. The fourth generation of the year, born in September, will live six months so they can last through the migration. Here in South Florida we have a resident population that does not migrateinfo. 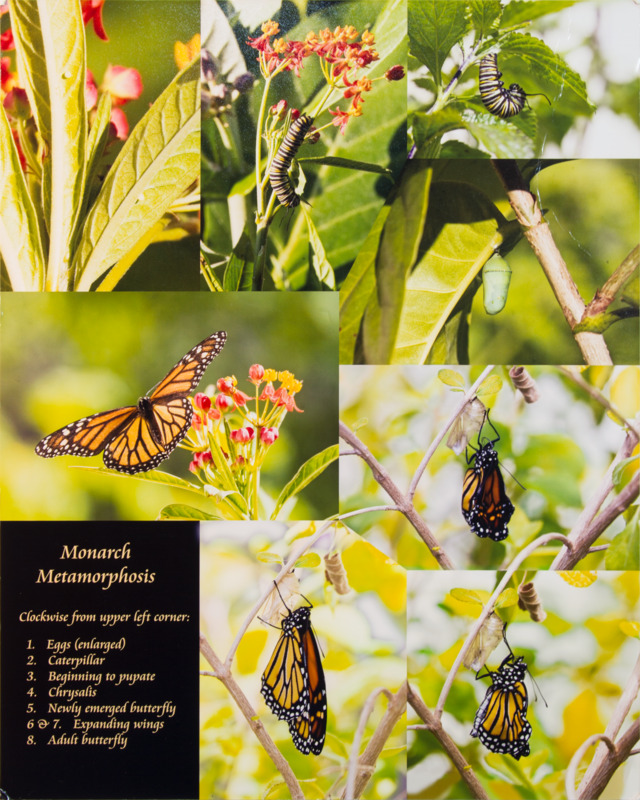 For more information, check out Pupating Monarch, which shows the transition between the 3rd and 4th images, Emerging Monarch, which shows the transition between the 4th and 5th images, and Monarch Butterfly On Tropical Milkweed, which is the 8th image in this group. Photographic details: Eight images were taken over 100 days. All used Canon EOS 30D camera w/ EF 100-400mm f/4.5-5.6L IS USM lens. Fine Art Paper 20" x 16" 51" x 41"